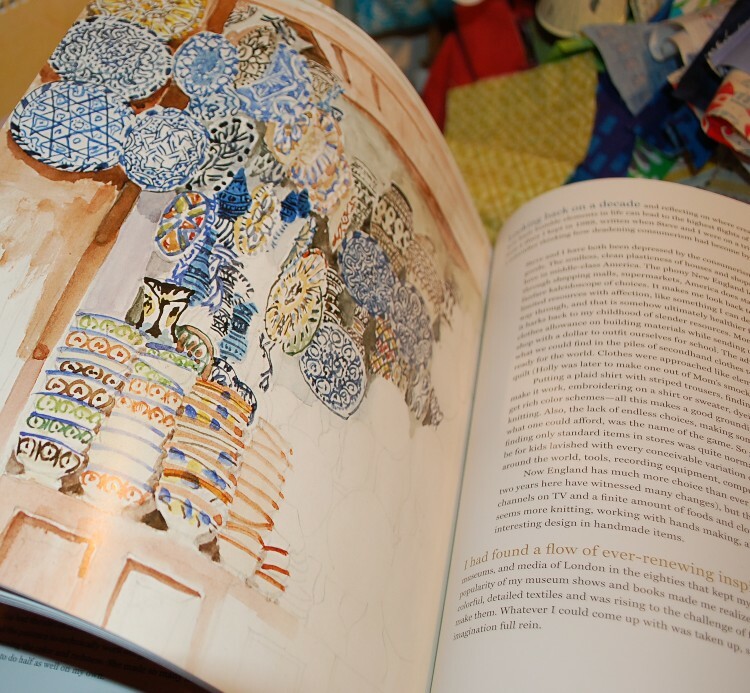 So when Traci from STC Crafts, an imprint of Abrams contacted me and asked if I would like to review the book below on my blog, I said of course, I’d LOVE to have a copy to peruse! Kaffe’s autobiography is a delightful read….okay to be honest here, I haven’t had enough time to READ the whole book, but I read bits and pieces throughout, and I can tell that when I DO get a chance to read the WHOLE thing, I will be delighted….and a bit sad when I am done, because it will be over. 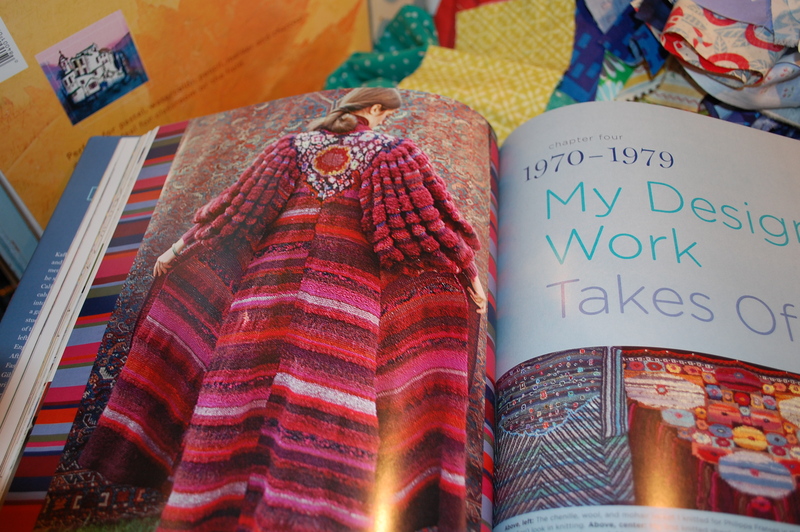 I have met Kaffe at numerous Quilt Markets over the years and have enjoyed every single visit. He is very down to earth when conversing but at the same time rather ethereal when it comes to design and color…..that’s because it’s really all he thinks about I think. I mean I am sure he plans what to eat and how to pay his bills, but that’s not where his mind goes first. And this book really helps you learn how he has become the man you meet today. Kaffe is about a year younger than my mother, which floors me because he seems so much younger to me! But then again he didn’t have children (unless I missed something scandalous in my quick read!!) He had a very Bohemian upbringing on the California coast surrounded by quite a few of the Hollywood royals. He has met a lot of famous people between California and London (his home since 1964….that’s the year I was born folks! 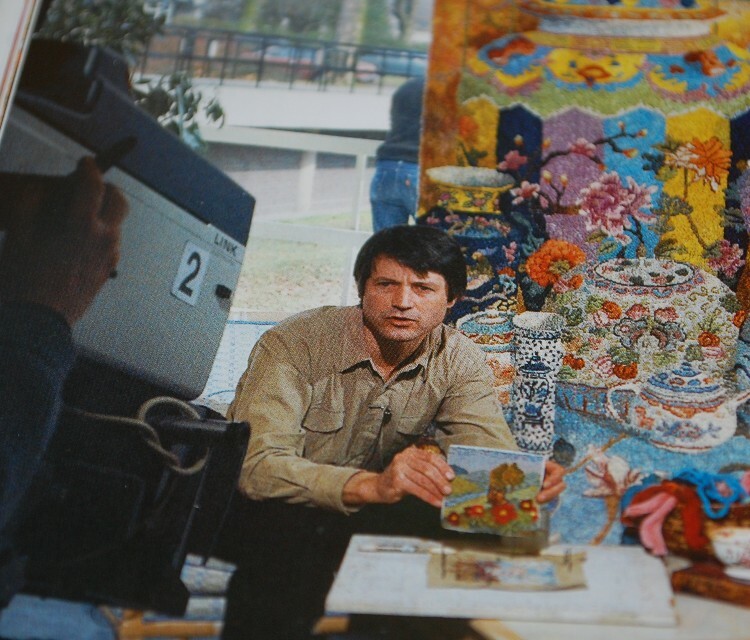 ), and he was encouraged to develop his art by many of those famous peeps! The book breaks down his life into sections covering his upbringing, striking out on his own as a starving artist (went to acting school in New York with Dustin Hoffman for a bit even), his painting phases, his mosaic phases, his knitting, needlepoint, yarn, fabric, patchwork, and all of those phases that realistically are all the same because of his great love for color and design. And it does so in a really easy read….just like a dinner conversation with a very long story at its center. Just imagine a very long European dinner party with an entertaining host…..that’s what it is like. A Glorious knit coat! Incredible! Check out this picture of him when he was younger! What a stud, huh? Just a little bit of pattern on these pages! 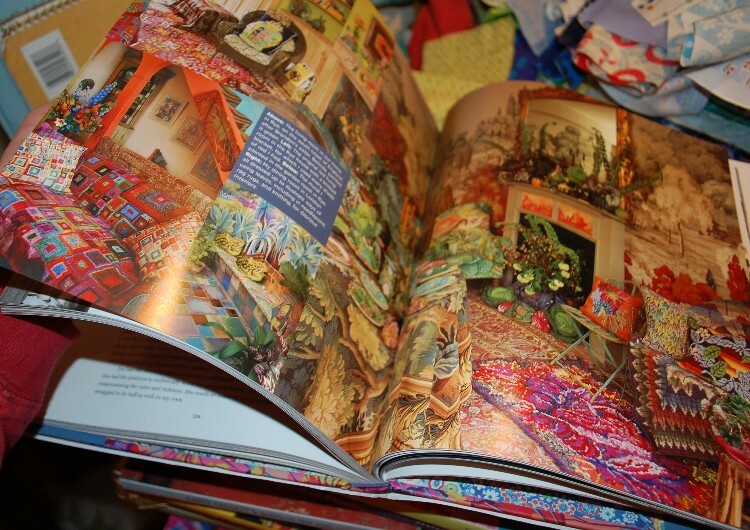 One of his paintings….there are a ton of little sketches and drawings and paintings scattered throughout his story, just like his real life I am sure. I haven’t seen Kaffe for a few years now, but when I do again (and I definitely hope to) I am looking forward to it, and hoping that I don’t come across as a stalker because I know so much more about him now. 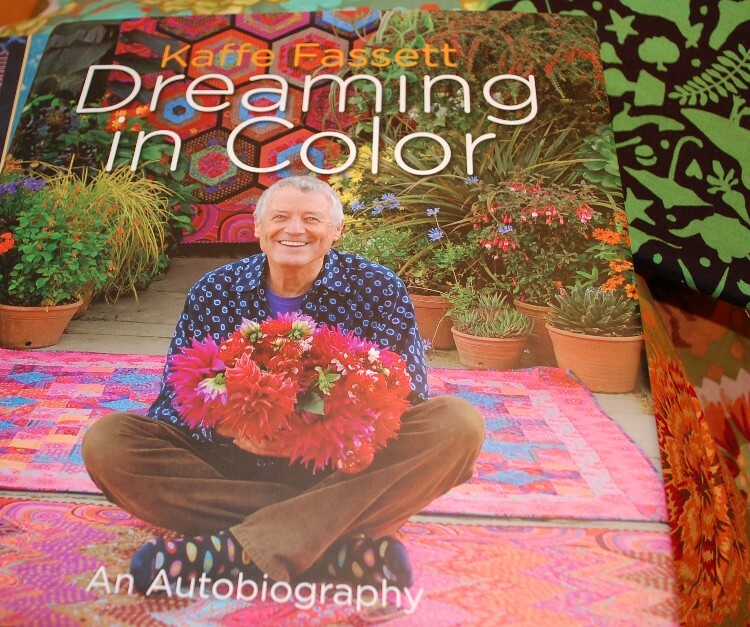 Dreaming in Color just came out this month…so if you want to get to know more than you ever thought you would about Kaffe Fassett (including how to pronounce his name AND how he got that name to begin with) and design and color you need to go buy it….right now….and be inspired completely!! Oh my what a handsome man especially in younger years, like all of us at one time, I guess. Sadly I have never bought any of his fabric. But that’s going to change soon. He has a wonderful mixture coming soon at Fat Quarter Shop that I want to try. The book sounds wonderful and the pictures look really pretty. Thank you for this book review. This is a book I need to buy. I thought I was a huge Kaffe fan but you’ve got me beat in the number of books you have. 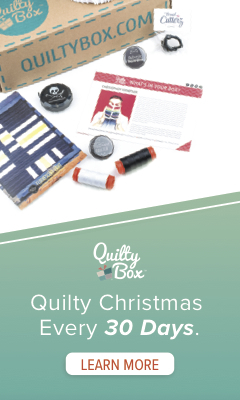 Is your fabric stash as big too? I can’t wait to get a look at this book. Just love his sense of pattern and color.